Scotland got their Nations League campaign off to a winning start with a comfortable 2-0 victory over Albania at Hampden Park. Steven Naismith was guilty of an awful first-half miss but made up for it shortly after half-time when his header went in off Albanian defender Berat Djimsiti. 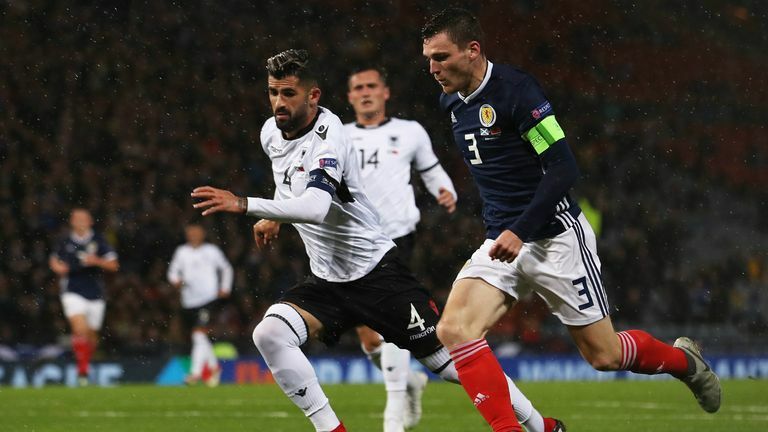 The in-form Hearts striker then added a second goal, punishing an error from goalkeeper Thomas Strakosha, as Scotland's persistent pressure eventually paid off. Bekim Balaj was guilty of spurning Albania's best chances, firing straight at Allan McGregor when the score was 1-0 before later blazing a volley over the crossbar from close range. But Scotland maintained a level of control throughout as they climbed to the top of Group C1 with victory in the first competitive match of Alex McLeish's second spell in charge. 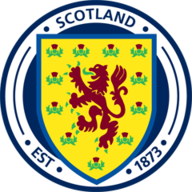 Scotland: A. McGregor (7), Souttar (7), Mulgrew (7), Tierney (7), O’Donnell (8), Robertson (8), McGinn (7), McDonald (6), C. McGregor (8), Russell (7), Naismith (8). Subs: Armstrong (6), Griffiths (5), McTominay (5). Albania: Strakosha (4), Hysaj (6), Veseli (6), Djimsiti (5), Binaku (6), Lilaj (5), Xhaka (5), Memushaj (5), Ndoj (5), Balaj (6), Gavazaj (5). Man of the Match: Steven Naismith. 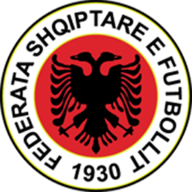 Facing an Albania team holding an early advantage in the group after their victory over Israel on Friday, the fixture already had a crucial edge to it. After Scotland's heavy 4-0 loss to Belgium in front of a half-empty stadium three days previously, a win and a positive performance were essential to ward off a growing sense of apathy towards the national team. To the delight of their manager, Scotland delivered both. In the pouring rain Scotland started on the front foot, winning a free-kick on the edge of the Albanian box inside three minutes. Callum McGregor's powerful effort was tipped over by Strakosha, before Albania made a mess while clearing the resulting corner and John Souttar near dispatched the loose ball. An incisive move on the right saw Johnny Russell fail to connect properly from Stephen O'Donnell's cross; Andy Robertson's return ball found Naismith but his effort was blocked by the chest of Djimsiti, before Albania cleared. Naismith then passed up a glorious opportunity on 24 minutes when he followed in Charlie Mulgrew's knock-down from John McGinn's free-kick, only to head against the post from three yards out before the ball spun along the line and then away from goal, to the disbelief of all watching. 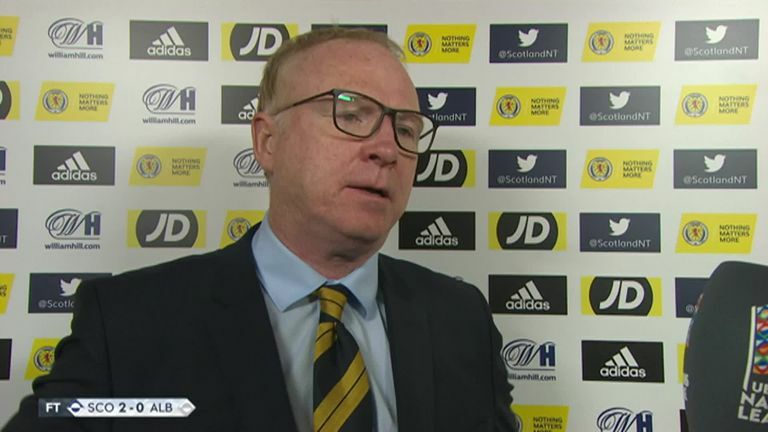 Johnny Russell and Stephen O’Donnell made their first competitive starts for Scotland, while Steven Naismith and Allan McGregor were recalled as Alex McLeish made four changes to the side that lost to Belgium. Waves of attack swept towards the Albanian goal without an end product. Scotland had the ball in the net on 41 minutes, as Naismith converted Callum McGregor's low cross, but the assistant referee ruled it out for offside, a close but ultimately correct call. The visitors had barely threatened but were then handed an opening when McGinn gifted the ball to Ledian Memushaj inside the Scotland half. The midfielder burst forward as the defence stood off him, but dragged his shot wide. Sixty seconds after the restart, Naismith atoned for his earlier miss, thumping home a header via a deflection from Djimsiti - though replays showed he was offside when Robertson crossed from the left. Albania were spurred into life and another stray pass from McGinn sent Balaj through, but he could not hit the target under pressure from the onrushing Allan McGregor. Balaj had an even better chance two minutes later, but the Scotland goalkeeper brilliantly saved the curling shot with his legs. As Albania pressed, Scotland continued to create opportunities; yet they were also guilty of overplaying at times, looking for the perfect final pass when a shot - on a wet and slick surface - would have been the better option. The three-man Scotland defence remains a work in progress, and it was cut open on 66 minutes. Emanuele Ndoj was allowed time to cross from the left, and Balaj met it on the volley, outmuscling Kieran Tierney in the process, but he smashed it over from 12 yards. That miss proved costly as Scotland added a second goal two minutes later. Strakosha came out to punch McGinn's corner, but it was headed clear by Frederic Veseli straight to Naismith who nodded it into the unguarded net. Scotland attempted 25 shots versus Albania; as many as they mustered in their previous four games combined (25 shots). Scotland are unbeaten in their last seven competitive fixtures (W5 D2), their longest run without a competitive defeat since September 2001 (7 games). Two of Scotland's last three goals in home matches have been own goals, with those netted by Berat Djimsiti (Albania) and Martin Skrtel (Slovakia). Scotland's Andrew Robertson created more goalscoring chances than any other player on the pitch (4). Six of Steven Naismith's eight goals for Scotland have come in home matches. Albania have kept just one clean sheet in their last nine matches in all competitions, a 1-0 win vs Israel. Alex McLeish: "Our tempo was great, we started off really well with attack after attack. It was one of those days when I thought nobody would get on the end of something. We were getting bodies in the box, we've been working on that. We've had really tough games in South America and took on the Belgians and we learned an awful lot from those games. I told the players before the game I trusted them to improve on the errors of the Belgium game they were excellent." Scotland are not back in action until October. They resume their Nations League campaign away in Israel on October 11, live on Sky Sports Football, before hosting European champions Portugal in an international friendly at Hampden Park three days later.